Kimi Räikkönen conducted the first day of running for E21 chassis #2 in Barcelona, completing 44 laps at the Circuit de Catalunya. Though Kimi completed the fewest laps of any driver today, he was nevertheless the second fastest for most of the day, including at the end of the afternoon session. Telemetry data-logging issues meant the team completed fewer laps than desired, but nevertheless concluded a productive day of assessment of the second E21. Kimi will drive tomorrow with the team targeting a greater haul of laps. Kimi Raikkonen ended day one of Barcelona Formula 1 testing frustrated as a data issue limited Lotus’s mileage. Raikkonen was second quickest, just 0.007 seconds behind pacesetter Nico Rosberg’s Mercedes. But the Finn’s tally of 44 laps was the lowest of the day, as problems with data-logging diagnostics interrupted Lotus’s programme. “We only did short runs,” said Raikkonen. Raikkonen said the disruption was minimised because Tuesday would not have been the most useful day of running. “The circuit is not in very good condition and it’s too cold still,” he said. Lotus will keep Raikkonen in the car for Wednesday before Romain Grosjean takes over for the remainder of the week. – The new computer system causes problems. When you don’t get data in the car during driving you can’t drive much, all you can do is short stints, Kimi Räikkönen agonized. Räikkönen drove 44 laps in Barcelona. The impression of the new car being an improvement from last year’s car only got stronger. – Everything in the car feels better – starting from the tires. Once we get more work done and more downforce in the car it will make driving even easier, Räikkönen thinks. – A test is always a test. If there are problems then it’s never nice to sit and wonder, but it’s normal in tests, Räikkönen said to MTV3. – I rather test on these tracks where races take place. In that sense it’s better in Barcelona than in Jerez. 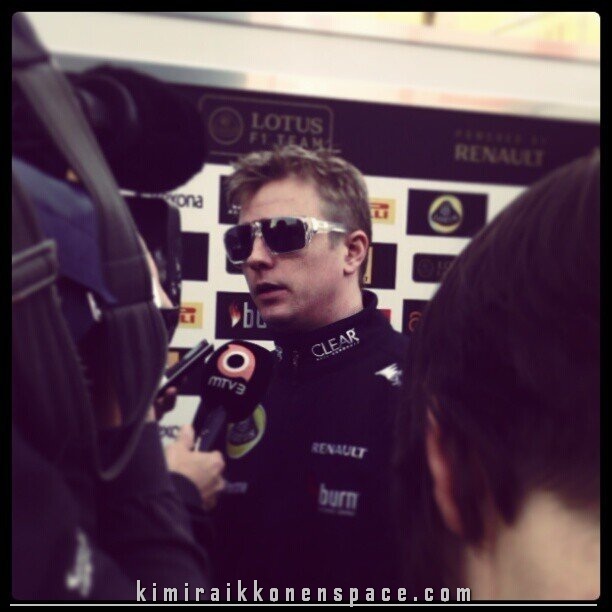 Räikkönen confirmed the observation he made already in Jerez, that the new Lotus car is better than the predecessor. – Of course there are a few things that needs to be fixed and improved. If comparing to last year’s beginning, or race, it feels better. It’s difficult to say how far it will take us. It’s not a bad start, Kimi commented on his car. – The car has also got a little more grip, so of course it helps, Kimi added.